Beginning today, Feb. 11 at noon CT, single-day session tickets to the 2019 NCHC Frozen Faceoff are on sale, as well as discounted student tickets. The National Collegiate Hockey Conference's annual championship tournament will take place March 22-23 at Xcel Energy Center in Saint Paul, Minn. for the second straight year. 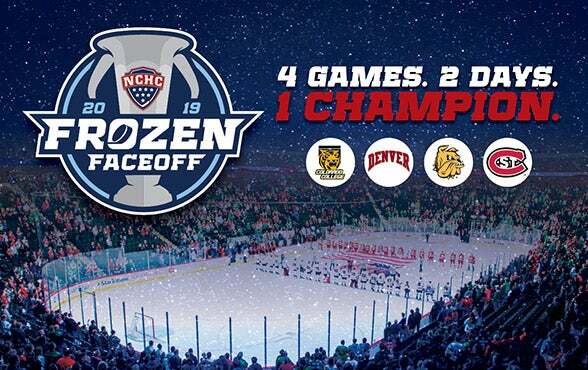 While all-session tickets to the 2019 NCHC Frozen Faceoff will continue to be on sale, fans now have the option to purchase tickets to only one day of the Frozen Faceoff. Single-day session tickets are available for both semifinal games on Friday, March 22 or a Saturday-session ticket provides access to the third-place and championship games on March 23. All-session tickets consist of tickets for both days (two tickets total) and all four games. On March 22, the first semifinal begins at 4 p.m. CT with the second game at 7:30 p.m. CT. The following day, the third-place game begins at 3:30 p.m. CT with the championship at 7:30 p.m. CT. Both single-day session and all-session tickets may be purchased at the Xcel Energy Center Box Office, by calling 800-745-3000 or online at ticketmaster.com. To charge by phone using Ticketmaster TDD/TTY, call 800-359-2525. Certain fees may apply. Single-day session tickets are available at several price points, including as low as $30 for select lower level seats, while club seats are available for as low as $45 for two games. All-session tickets begin at $55 for all four games. A link to the Xcel Energy Center seating chart can be found here. The NCHC is also offering special ticket pricing for students of NCHC member schools. NCHC students may purchase up to two (2) all-session ticket packages in select lower level sections for $35 each. Single-day session student tickets are available for $20. Student tickets may ONLY be purchased online at ticketmaster.com using a school-specific code that is available through each school's ticket office. Certain fees may apply. Contact your school's athletic ticket office for more details. For groups of 12 or more, please call 651-312-3486. Discounted hotel rooms are available for fans attending the 2019 Frozen Faceoff at select hotels in downtown Saint Paul through Visit Saint Paul. A special link to the discounted room rates for Frozen Faceoff fans have been set up to book your hotel. In addition to the games, several fan events are planned around Frozen Faceoff weekend, including a Fan Skate, NCHC Awards Celebration, NCHC Fan Fest presented by Bud Light, and post-game parties. Frozen Faceoff team practices will be open to the public on Thursday, March 21 and Friday, March 22. The NCHC Fan Skate will once again take place on the eve of the Frozen Faceoff on Thursday, March 21 from 7-8:30 p.m. CT at Xcel Energy Center. Fan Fest presented by Bud Light, featuring music, interactive games, food and drink, and much more, will take place both days of the Frozen Faceoff from 2-7:30 p.m. CT outside of Xcel Energy Center. The official NCHC Post-Game Party will then be at Tom Reid's Hockey City Pub after the games each night. For more information on tickets, visit NCHCHockey.com/tickets, while other Frozen Faceoff information is available at NCHCHockey.com/frozenfaceoff.